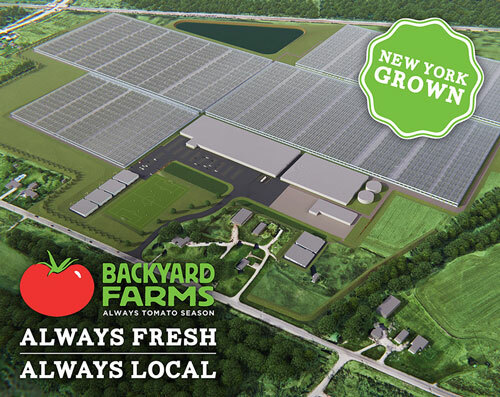 KINGSVILLE, ON and ONEIDA, NY - Mastronardi Produce is providing a big boost to its Backyard Farms® brand; the company has announced plans to grow the beloved brand by introducing a new high-tech greenhouse in the United States. The company promises its new greenhouse, located in New York state, will be the largest-ever single build in North America. According to the company’s press release, the 71.6-acre glass greenhouse is only Phase I of the company’s mission to satisfy customer appetites—and exceed flavor expectations—for locally grown Backyard Farms tomatoes. In total, Mastronardi produces and delivers fresh, flavorful produce to retailers from more than 4,000 productive acres of growing capacity. The company’s new greenhouse will more than double Backyard Farms’ greenhouse growing acreage and increase Mastronardi Produce’s internal greenhouse network to seven locations across the United States. New York-grown Backyard Farms tomatoes are slated to hit stores by Fall of 2019.